‘Kukunti lang ang kilala kong may itsura na Smart user.’ - a line from Globe Telecoms CEO, Ernest Cu during the CloudFone Thrill Launch at the Prive Luxury Club, The Fort Strip, Bonifacio on February 12, 2013. This attack continue to earn negative reactions and outrage on the part of Smart subscribers. The deplorable insult according to some bloggers and majority of netizens is un-CEO manner and in contrast for the healthy competition Globe should learn. It is not proper to attack your competitor's subs on below the belt style. It's better that Cu boasts their near-completion achievements on network modernization and upgrades. "Whether it was in jest or not, that retort was the most unCEO-like that I have ever heard in my whole life. At the launch party of Cloudfone Thrill, Globe CEO Ernest Cu went on stage and uttered these words in the hopes of livening the party. Little did he realize that there were a number of Smart users in the group and such potshots are too low for a man of his position. This gives me the impression that the company is desperately struggling against their competitors. When I heard it, my jaw dropped. Obviously, there was very little laughter over this remark, with perhaps the few chuckles coming from his own people. ", Arpee Lazaro said on his blog. Since the start of 'LiveMore' campaign, netizens also see attacks of Smart on Globe network for it's trouble, signal failure and delayed SMS with ads scattered online and tv advertisements. Smart also said that it's network has '4X the Fiber Power' which is indirectly compared to Globe. All of these are part of healthy competition not a cheap way to put down your rival. It is not clear whether Smart Communications, Inc or Globe Telecoms will send out statement for this incident. Though this only a black propaganda of the latter on their stiffer competition today, this act should be condemned. Are you a Smart or Globe user? 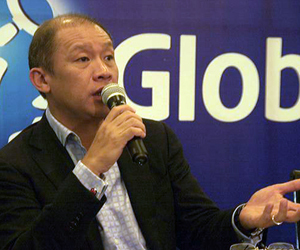 Tell us your thoughts on the uncouth remarks of Globe CEO.